Austin's Growing Fast, But Why Isn't Its Public Transit? 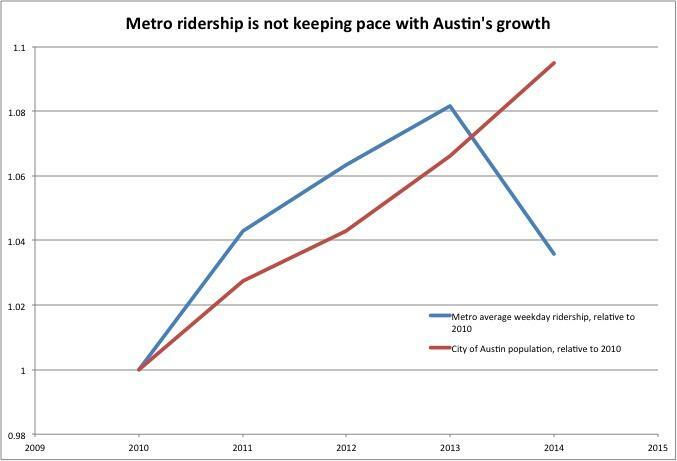 Ridership is down system-wide on the Capital Metro system, even though Austin is growing rapidly. This is the first in a two-part series on transit use in Austin. Read Part Two: After Ridership Drops, Where Does Cap Metro Go From Here? Austin is one of the fastest-growing metro areas in the country. Over the last five years, the population in the city limits has increased by nearly a 100,000 people, an 11 percent increase. In the larger region, the growth is even greater. But there’s one part of the city that isn’t growing: transit ridership. Let's take a look at what's behind that trend, in the first of a two-part series on transit use in Austin. "Ridership has not increased as much as our city has grown," says Jace Deloney, chair of the Urban Transportation Commission, a city board that advises on transportation issues. "We haven't kept up in terms of providing transit service to the people that are moving here." Data provided by Capital Metro shows that average weekday ridership across the system took a big drop over the last year, down 4.25 percent. 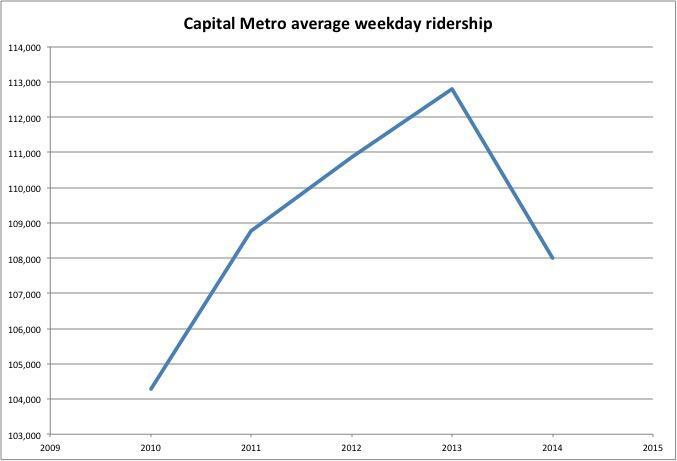 Last year, Capital Metro had the same ridership it did in 2011. That's at odds with national trends, where the numbers show more and more people using public transit. Imagine if a company who has posted profits for several years straight suddenly went the other direction. What's wrong? Credit Source: Capital Metro. Graph by Philip Issa. "There's a few reasons to explain the dip we seem to be looking at in 2014," says Chris Riley, Vice-Chair of Capital Metro's board and former city council member. "First, continued reductions in UT ridership." The University of Texas at Austin has cut funding in recent years for its share of the Capital Metro system, reducing shuttle service. "And partly because of changing transportation patterns among the students," Riley adds. "You have more students living in West Campus today and not riding the bus." "Of the overall percent in reduction [in 2014], what we found was the UT shuttle system accounted for a full 2 percent of that ridership decrease," says Todd Hemingson, Vice President of Strategic Planning and Development with Capital Metro. Hemingson and Riley say there were several other factors that led to last year's drop in ridership: fare increases and restructuring as well as some extreme weather events. But even all those factors together don't account for the entire drop. And when pushed a little further, Hemingson says the problem goes deeper. "Really, any analysis of transit ridership begins and ends with how much service you provide," Hemingson says. The actual number of hours of service Capital Metro provides per person in Austin is down, and so ridership is down as a result. "Unfortunately, the reality is we're just not keeping up. Our service hour, as we call it, has been declining since 2004." But despite those reductions in service hours, ridership has increased during that time. Deloney with Urban Transportation Commission thinks that the 2014 drop was due to something more specific to that year. "I think a lot of it has to do with the changes that took place in 2014. Lots of changes," he says. "We had Metro Rapid launch, which caused a lot of issues for some people." Deloney is talking about a very well-documented cut to the city's most popular bus route last year. When Capital Metro launched it's first rapid bus line, the 801, it also cut the local bus service (the 1) along the same route in half. Up until then, the 1 was the most popular bus route in the city. "One of the things we knew going in was that not everyone was going to like that," Hemingson says. "And that's what we saw, a drop in ridership in the corridor, that's undeniable. But since we've launched MetroRapid, we've seen that trend in the right direction, which is positive." While the agency says there are no plans to restore the frequency of the 1, the agency took steps to not cut local service as much when launching its second rapid bus line (the 803) in another corridor. And while ridership is still down slightly from where it was before in the first rapid bus corridor, it's actually higher than it used to be in the corridor of the second rapid bus. Another change that had an impact on many riders last year was moving many bus routes off of Congress Avenue downtown several blocks over to Guadalupe and Lavaca streets. "The verdict is out, from my perspective, on whether these changes that took place will end up contributing to more ridership in the future," Deloney says. Credit Sources: Capital Metro; City of Austin. Graph by Philip Issa. While Capital Metro's CEO Linda Watson has been lauded for managing a financial and ethical turnaround at the agency, Capital Metro hasn't been successful in the main objective of a transit agency: moving more people around. That's something Hemingson acknowledges. "The reality is, the total amount of service we're providing is not keeping pace with the population," he says. Last year was the first year under Watson's leadership that ridership has fallen. When she took the helm of the agency in 2010, increasing ridership across the system was not one of her stated goals, and it still isn't. While Capital Metro gets audited for its contracts, gas, advertising, grants and more, it doesn't get audited for its ridership. In fact, there is no goal or target for system-wide ridership at Capital Metro. There are also several factors that are out of Capital Metro's control. Land use and density, for starters. Much of the population growth in Austin is happening outside of the city itself, or along its periphery. That development typically consists of large lots with single family homes that are difficult to make work with transit. "If we had a code that allowed for more development along our corridors, in places that are easier to serve with transit, then I think you'd see a healthier rise in our transit ridership," Riley of the Capital Metro board says. Without the land use changes necessary to make transit really work, there's only so much Capital Metro can do. It's also worth noting that even though transit ridership is up in the nation, much of that growth is happening on rail lines. Bus ridership is actually down a little nationwide. And other Texas cities like Dallas and San Antonio have also seen drops in their ridership. Ridership can also be a volatile trend, rising and falling rapidly based on gas prices and employment. While a drop like Capital Metro saw last year was unexpected, it isn't insurmountable, Deloney of the Urban Transportation commission says. "In a lot of ways, [in 2014] we came to terms with some of the issues that we were dealing with over the past decade," he says. "And in 2015 I hope we can move beyond those and come to a point where we're actually improving on the system." Capital Metro says they have a plan that could improve ridership and meet the needs of more Austinites. "I think we're on the cusp of making a significant step in the right direction," Hemingson says. So now we've diagnosed the patient. Now let's take a look at possible prescriptions to turn around Capitol Metro's ridership decline: After Ridership Drops, Where Does Cap Metro Go From Here? Austinites taking public transportation will see a hike in bus and rail fares next week. Starting Jan. 11, fares are going to go up on Capital Metro mass transit. For bus-goers, what cost just fifty cents six years ago will now cost $1.25. Capital Metro is increasing the base fare for rides on local bus routes this winter, a 25 percent increase. Fares are also going up for what the agency calls its premium buses, like MetroRapid, to $1.75 per ride. Additionally, a trip on the Metrorail Red Line will now cost you $3.50 each way, up from $2.75.